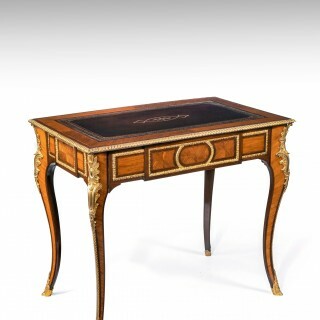 An extremely fine 19th century French Louis XV revival gilt ormolu mounted Kingwood bureau de dame / writing table. 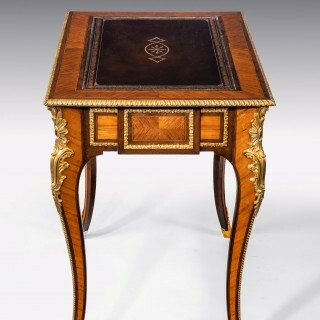 Very attractive and of the finest quality this Kingwood bureau de dame or ladies writing table dates to circa 1870. 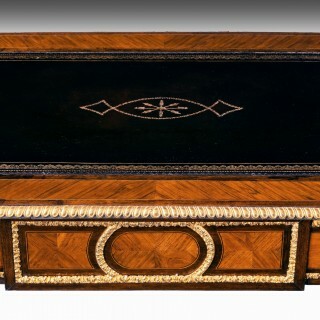 The rectangular top having an inset gilt tooled leather writing surface with surrounding bookmatched veneered kingwood crossband with rosewood, boxwood and ebony inlaid banding. 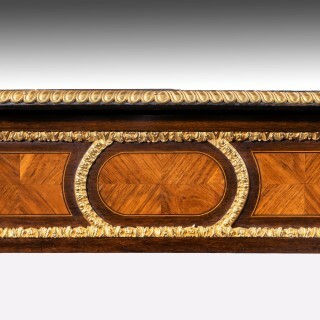 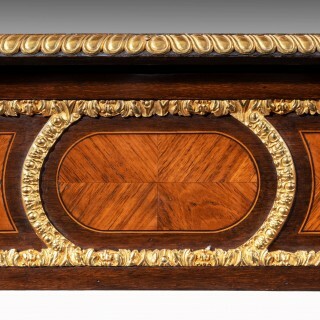 The edge having a gilt ormolu banding sits above a single kingwood frieze oak lined drawer with concealed locking mechanism, being rosewood crossbanded and outlined with boxwood and ebony stringing. 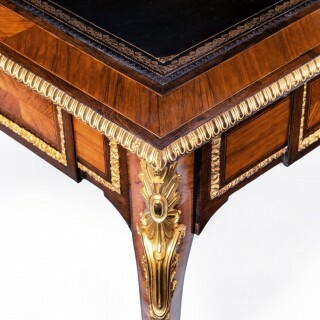 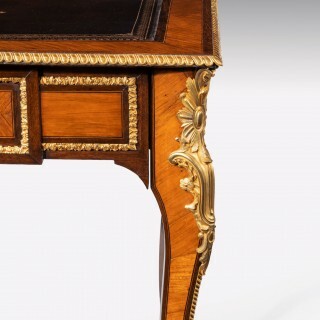 The drawer and sides have a matching design being adorned with very fine gilt ormolu banding, enabling this writing table to stand freely within the room the rear is mirrored to the front. 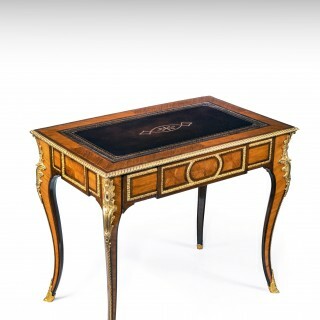 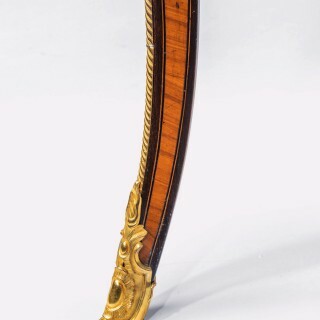 Raised on slender serpentine legs with fine ormolu mounts to the knee and terminating on gilt sabots. 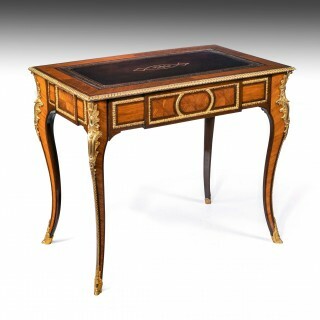 This wonderful French writing table is of the finest quality and excellent colour throughout. 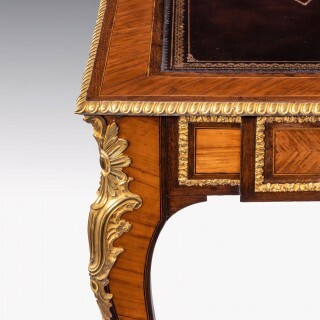 Having been finely restored the mounts have been re guilded with pure gold as they would have been when made. 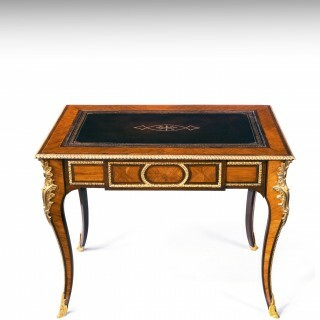 A fine addition to any collector or home.